If scream-worthy rollercoasters are on your bucket list, and if you happen to be in the vicinity of Charlotte, North Carolina, then head over to Carowinds, one of the most thrilling amusement parks in the United States and tick that off your list. A 400-acre seasonal park, open from March to December, Carowinds, like its windy namesake, has an ever-shifting schedule of hours and days that it is open. Located in Charlotte on the border of North and South Carolina, the park was so named as a way to reference both Carolinas and the winds that cross the border between the two states. 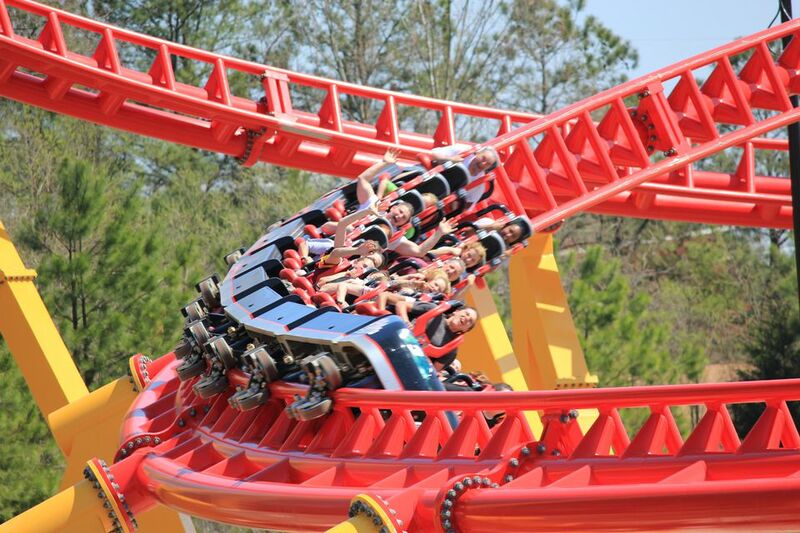 In fact, two of the park's roller coasters start in North Carolina and cross state lines. The park was opened in 1973 by Charlotte businessman Earl Patterson Hall, who was inspired by a 1956 trip to Disneyland in California. Currently owned and operated by Cedar Fair, the park changed hands a few times over the decades, including ownership by Paramount. For 13 years the park had been called "Paramount's Carowinds." The park features 64 rides, appealing to all levels, from a children's mini-park, called Snoopy Camp after the popular Peanuts franchise, to some of the most aggressively styled, thrilling rides. The rides at Carowinds are based in eight themed areas. The mega coasters and giga coasters, so named for their varying degrees of height, are not for the faint of heart. Some of Carowind's 13 roller coaster rides are filled with consecutive 360-degree loops, backward inversions, and uphill helixes. The giga coaster (a coaster taller than 300 feet) Fury 325, was added in 2015, and is one of the world's longest, tallest, and fastest steel roller coasters. It boasts speeds up to 95 miles per hour. It can be found in the Thrill Zone themed area. There are a number of entertaining shows for children and merrymakers of all ages. Every season, the park usually adds something new to attract its regulars back for more chills and thrills. Seasonally, Carowinds offers the Carolina Harbor waterpark, which is included in the admission price to the park. You can enjoy giant water slides and wave pools as well as a three-acre kids area with play structures suitable for children. Another seasonal attraction is "SCarowinds," which is when the park transforms into a Halloween-themed, "scare" park. More than 500 "monsters" roam throughout the park, and the shows reflect the Halloween theme. Some seasons, Carowinds hosts its ever-popular WinterFest, when the park morphs into a winter wonderland of fun. The park features a grand display of holiday lighting, festive décor, live entertainment, and fanciful experiences, including up to 16 of your favorite rides. The park menu reflects the season with smoked turkey, carved hams, and traditional desserts. Carowinds offers lodging at its Camp Wilderness, where you can book a 1,100-square-foot fully appointed executive cabin, which sleeps up to 14 people with four bedrooms and three bathrooms plus a spacious great room with a 65" flat screen television along with a wrap-around porch with rocking chairs, an outdoor grill, and patio. If you have a smaller traveling party, you might want to consider a stay in a two-bedroom, one-bathroom cabin that can accommodate up to eight people. One bedroom has a double bed and the other has two bunk beds, as well as a futon couch that converts into a double bed (linens not provided) in the living room. These cabins have kitchenettes, a dining area, satellite television, air conditioning, and hot water. If you have your own accommodations in the form of an RV or tent, Camp Wilderness features RV, pop-up and tent sites. The RV site can accommodate RVs up to 40 feet in length. The paved RV site feature full hookups with water, sewer, and 50-amp electric service. In addition, there are 56 spacious tent and pop-up sites with water hookups and 30-amp electric service. Every site features a charcoal grill. If Camp Wilderness is not exactly what you had in mind, Carowinds recommends nearly two dozen local hotels with prices ranging from $70 to $200 a night depending on the season and the luxury level of the accommodations you seek.